Scene: Man climbs atop hot-air balloon, moored near fairground. Balloon un-tethers and takes to the sky. So begins comedic magic, at least in theory. 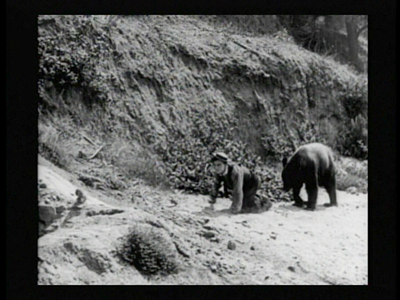 The theory presumes that such a promising premise, executed by Buster Keaton, can only soar. And why not? The man could build a gag out of any situation; the more static, the less animated, the more limited, the better. Surely a balloon basket would be Keaton’s ultimate creative outlet—slung as it is beneath a fragile airbag, at the mercy of weather, birds, planes, leaking pouches of sand; all of them posing lethal consequences. A man in a balloon must do anything to keep aloft—anything—and that means The Balloonatic could have gone anywhere Keaton wished. So why does it only go down? All of Keaton’s great characters fixate on something; their tunnel vision leads them into trouble and then points them to ingenious solutions. They win our hearts along the way, because the prospects of failure are, for them, devastating. But the balloon-rider has no obsession. Nor does he have a job that forces him to make tough choices. Nor is he homeless, as far as we know. He’s a passionless wanderer, seeking only distraction, which is why we first meet him at a carnival funhouse, in the middle of the day, being ejected through a trap door and down a slide to the ground. Keaton lands backside-first in the dirt, in front of an equally indifferent carnie who quickly takes a dime from a plump lady and sends her inside. His own dime now spent, our hero apparently has nothing better to do than stand in front of the exhibit, toeing the sand, because that’s what he does, until the plump lady sails down the slide and collides with him. This is the first and best example of why The Balloonatic doesn’t work. The Balloonatic’s not about a guy who’s thwarted in funny ways—it’s about a guy to whom funny things happen, randomly. We learn nothing more of him than that, even after his wanderings bring him to the site of the balloon launch. He wasn’t trying to find a balloon either, of course; he could just as easily have wandered to the pool. How much funnier would it have been if Keaton’s character was a balloonist himself? What could his motivation be then? Adventure? A record-breaking trip around the world? A race? Idle pleasure for the son of a wealthy man? And if balloons were not the man’s forte, what other circumstances could send him skyward? Maybe he would be in pursuit of a villainous aeronaut who has captured his lady? Perhaps he’d be the one pursued, and he’d jump into the balloon’s basket to escape? Anything is better than what Keaton gives us here, because in every one of those cases, the man would have something to lose aboard that balloon, besides his life. What's so interesting about a life? We all have one. Anyway, once aloft, Keaton scales the netting of the balloon and arrives safely in the basket. This should have been the start of ten—no, make it fifteen—minutes of gags, built around his attempts to stay airborne and eventually land. Instead, we get two. Two minutes, one measly joke. I still can’t believe it. The man is in a balloon he can’t control. 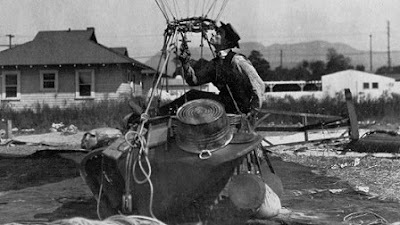 The balloon’s basket has no bottom (a huge problem Keaton forgets immediately after establishing it). The owner of the balloon is apparently an outdoorsman, so the craft is outfitted with hunting equipment of all kinds, including a rifle. This could’ve gone on for days. Instead, he drops a bunch of duck decoys on strings over the side of the basket, takes aim at a bird they attract, and shoots a hole in the balloon. That should have been the last joke, not the first. The Balloonatic, apparently mistitled, plods on for another 15 minutes as a second-rate campsite comedy, pitting the forest-marooned Keaton against bears, a poorly built canoe, a bottomless fishing satchel, and a love interest (Phyllis Haver) with better survival skills than he has. Keaton’s adventures in the woods, like those at the carnival, are directionless. He fishes to eat, perhaps, but why does he canoe? He’s got nowhere to be, so what’s the rush to get home? Does he even have a home? And if the girl’s so hot, why not focus on helping her? 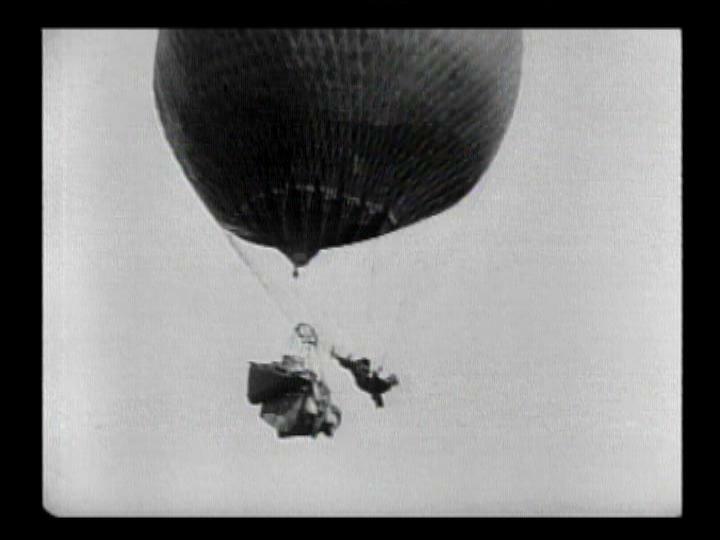 The Balloonatic’s closing scene is the closest it gets to the kind of comedic poetry Keaton is revered for today. I feel I shouldn’t spoil it, which adds one more element of frustration to this viewing experience. Of all the man’s films (and I have seen them all), only this one seems—what’s the word? Lazy. There’s probably a hundred balloon-themed puns that could sum it up better, but I work best when inspired. Kino International’s The Art of Buster Keaton box set (also available as individual discs) packages The Balloonatic with another of Keaton’s short films: Neighbours (1920) and his excellent feature film, Seven Chances (1925). I honestly thought The Blacksmith was lazier than this one, but I do agree this is one of Keaton's lesser efforts.